As well as cost effective printing, we also offer our design services at a competitive rate. New Start Design does things differently to large design agencies. We don’t baffle our clients with confusing creative ‘lingo’ or force wild and wacky ideas that aren’t suitable or relevant. Instead, we listen to a clients needs and gain a full understanding of their own vision for the project. We then develop this vision, working closely with the client to create business focused, innovative and effective concepts. Our experience in the design and publishing industry means that we know how to create effective design that has a big impact on a wide audience. Many of the organisations we quote for like the work we produce for them so much that they become regular clients. 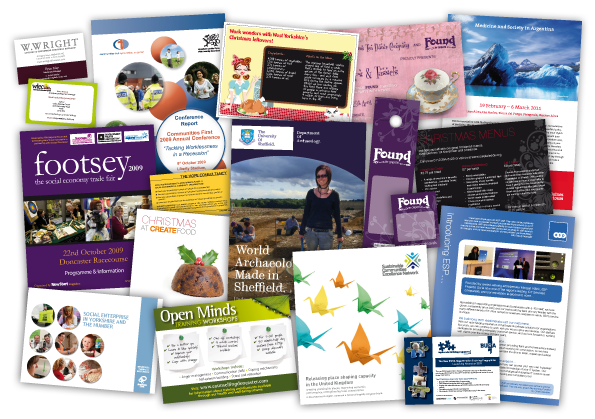 Our range encompasses everything from one off promotional pieces to branding design, advertising campaigns, websites, annual reports, publications and exhibition banners. We will work with you to help make your flyers, business cards, posters or other material both effective and stand out. Based in Sheffield’s Cultural Industries Quarter, we design and print for regeneration and social enterprise clients, universities, think tanks, public, private and voluntary sector organisations all over the UK. Some of our recent clients include South Yorkshire Fire & Rescue, Jon Baines Tours, Sheffield Window Centre and Unity Trust Bank.